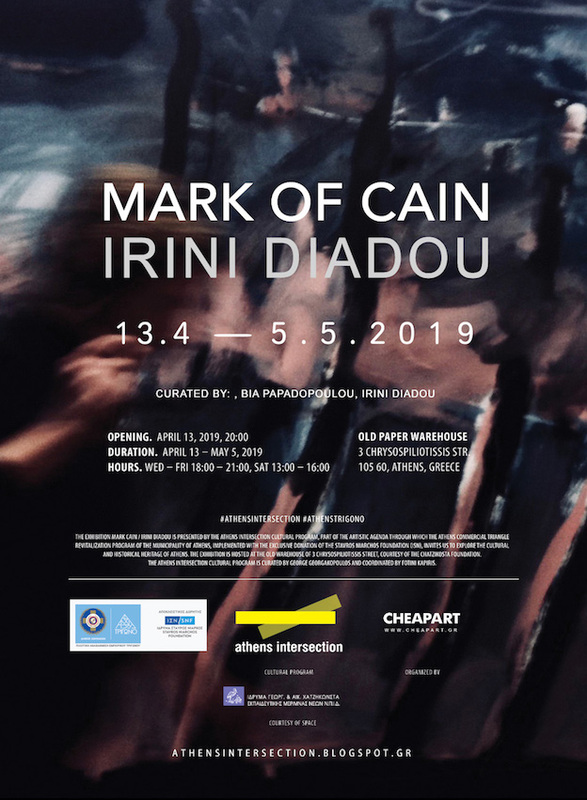 The exhibition by Irini Diadou entitled Mark of Cain will be inaugurated on April 13, 2019 at the Old Athenian Paper Warehouse on 3 Chrysospiliotissis street. Diadou’s paintings perform as a kind of visual manifesto on the constant and unspeakable violence present since the beginning of the world, mutated as an act of personal liberation and exorcism of evil. horrendous moments of history depicted on the canvas have mutated into an act of personal liberation and exorcism of evil by the artist. Violent gestures that automatically seem to externalize both the conscious and the unconscious, outline compositions that evoke associations with explosions, darkness, blood, scorched earth. The exhibitions are curated by Irini Diadou in collaboration with Bia Papadopoulou. Special thanks to: Bia Papadopoulou, Julia Tsiakiris, Lina Bebi, Yannis Perdicoyannis for their valuable help. The exhibition Mark of Cain / Irini Diadou is presented by the Athens Intersection Cultural Program, is a part of the artistic agenda through which the Athens Commercial Triangle Revitalization Program of the Municipality of Athens, implemented with the exclusive donation of the Stavros Niarchos Foundation (ISN), invites us to explore the cultural and historical heritage of Athens. The Athens Intersection Cultural Program is curated by George Georgakopoulos and coordinated by Fotini Kapiris.